Even with these models of course, the focus is on the benefits of SelfLine 4.0 equipment. Comfort cab, new drive and new hydraulics, integrated multi-functional armrest with CAN-bus control system and the new turbo auger make the operation efficient and economical. The models Premium 15, 19 and 22 can collect feed from up to 5m height with the long milling head arm. The standard drive on these models is a Volvo 4-cylinder turbo diesel engine with 129 kW (175 hp), emission standard stage IV (and with 160 kW / 218 hp as option). The Prestige range of self-propelled mixers feature a unique three -point chassis – the steering rear wheel ensuring the machine turns about the front axle. This is an ideal solution in small buildings and farms with limited space or access. Rear wheel steering offers the smallest possible turning circle, plus the ultimate control of machine position during loading and discharge. This is particularly important to ensure that feed is discharged in the correct place and to reduce losses during loading. For example – ultimate steering control ensures the machine can be positioned so that the milling head can collect material even from the edge of the silo. This means reduced manual work and reduced material loss. 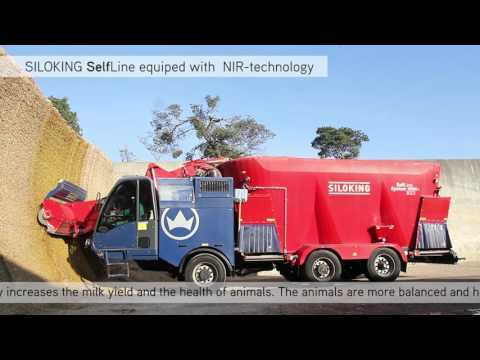 Small silos, low building entrances, low cattle sheds, even narrow feed passages are no problem for the Prestige range of self-propelled feed mixers.